Some simple dietary recommendations and fitness tips are below. I am a 6’1″ 185lb 30-year-old white male with a desk job that walks about 3 miles per day and exercises for about 4 hours per week. This makes my basal metabolic rate (BMR) approximately 1,855 Calories per day. My exercise represents about another 650 Calories per day, for a total about 2,500 Calories per day. The Body Weight Planner is an excellent tool for calculating your BMR and getting nutritional information. As you do further research, I implore you to remember that you shouldn’t believe everything you read on the internet. Use a tool that will help you find studies, not blog posts, like Google Scholar. Did You Know? 1oz of chocolate = 150 calories = 23 minutes of walking. 1/4lb of raw beef = 200 calories = 6 cups of vegetables. 12oz orange juice = 36g sugar = 3 oranges. In the following essay a doctor makes a plea for caregivers to endorse scientifically backed dietary recommendations. I especially like the focus on increasing and decreasing consumption, rather than eliminating. 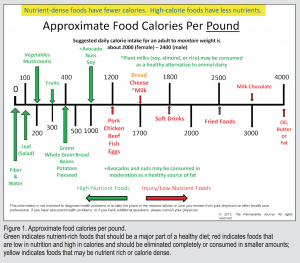 I think Figure 2 is an excellent visualization of the tradeoffs between calories and nutrients. yellow indicates foods that may be nutrient rich or calorie dense. I play hoops a few times a week and make it to a Tabata class often which is time consuming and expensive, but I also do free, short, simple things too. The New York Times put together a 12 exercise plan requiring no equipment, available free at https://well.blogs.nytimes.com/2013/05/09/the-scientific-7-minute-workout/. I like to do this one after my lunch break to re-energize, instead of an afternoon coffee. I programmed it into the Tabata Timer app (see my post) so it goes straight into my fitness tracker. If you use Google Fit and you walk around, it automatically tracks your activity and shows you a nice little graphic with the goal of keeping your heart healthy. Hard to argue with that! To keep your heart healthy, the American Heart Association and World Health Organization encourage staying active. Each week, they recommend you do at least 150 minutes of moderate activity or 75 minutes of vigorous activity. We, as caregivers, are letting our patients die by not taking a strong, proactive role in promoting healthy eating and an active lifestyle, and encouraging emotional resilience. These principles are the cornerstone of the rapidly emerging subspecialty known as lifestyle medicine. Current medical practice is reactive: surgery or a prescription for every illness. This needs to change. A paradigm shift to lifestyle medicine must be implemented immediately. Dramatic effects using lifestyle interventions have been demonstrated in patients with chronic conditions, which now include breast cancer. Several large studies have conclusively shown that diet and exercise modifications can significantly improve total health. One prospective study of 23,000 participants evaluated adherence to 4 recommendations: no tobacco use, 30 minutes of exercise 5 times per week, maintaining a body mass index less than 30 kg/m2 , and eating a healthy diet (high consumption of fruits, vegetables, legumes, and whole grains, and low consumption of meat). People who adhered to these 4 recommendations had an overall 78% lower risk for development of a chronic condition during an approximately 8-year timeframe. Furthermore, in those adhering to the recommendations, there was a 93% reduced risk of diabetes mellitus, an 81% reduced risk of myocardial infarction, and a 36% reduction in the risk of cancer. 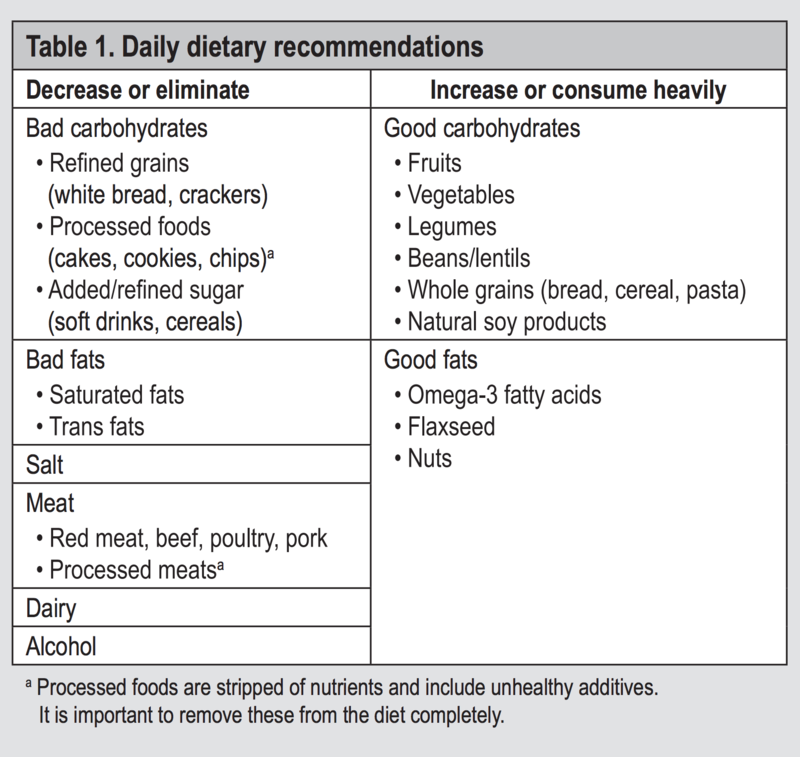 Ample evidence exists to support the avocation of a diet based on the recommendations noted in Table 1. In addition, a whole-food, plant-based diet tends to promote a healthy body mass index, which is associated with, yet again, a lower risk of all common cancers. 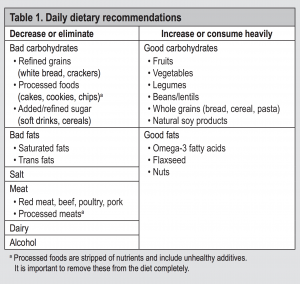 Dietary principles cannot be fully addressed without consideration of caloric density. Caloric density refers to foods that may or may not provide high amounts of vitamins and nutrients, but contain higher levels of calories. 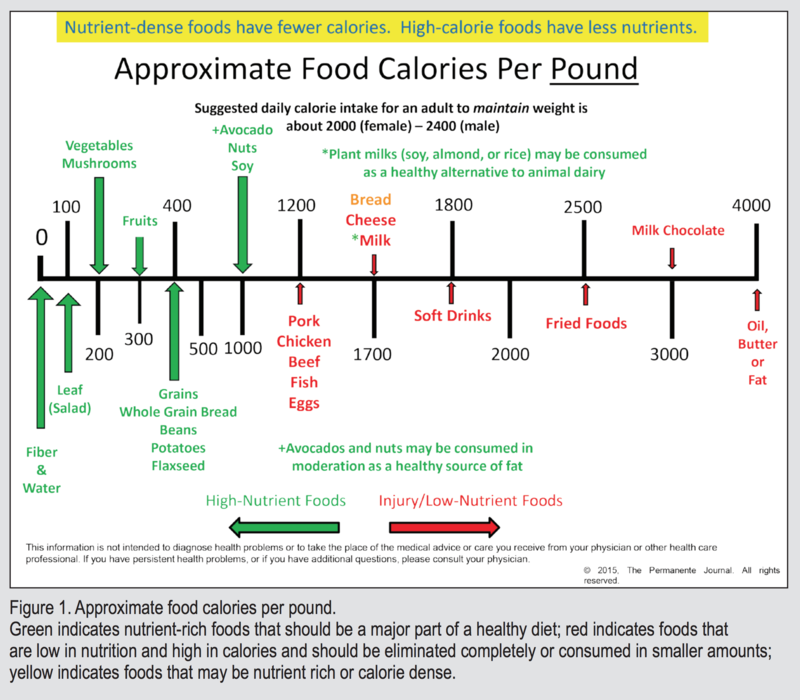 High-nutrient foods have fewer calories per pound in contrast to low-nutrient foods (Figure 1). A healthy diet should remain in the green zone as much as possible and constitute the bulk of food intake. Sadly, because profit motives play a large role in the business of health care, the delivery of care and the care of patients is often politicized. Most chronic conditions are influenced by lifestyle and account for more than 75% of health care costs. Since 2009, more than 17% of the US gross national product has been spent on health care, amounting to more than $2 trillion. Few, if any, of these dollars have been spent on identifying the true underlying etiologies of these chronic conditions. Lifestyle changes have taken a backseat to disease treatment. If we continue on the pathway of treating risk factors and developed disease, we will bankrupt the health care system in the near future. Costs for care will continue to escalate; lives will continue to be lost. It is time for the medical community to intervene and to intervene aggressively. We are not providing the proper treatment when confronting conditions that can be prevented and may even be reversed with lifestyle change and education. Current and future physicians must be trained in lifestyle medicine. The neglect of both the root cause of disease and corrective interventions continues to further the development of chronic conditions and ultimately demise (Figure 2). Lifestyle management courses should be required annual training for all health care employees, optimally as we do annual training for corporate compliance. It is time to prevent disease in all aspects of our lives and the lives of the people we love. It is time to change our health destiny by changing our hearts and minds from an unhealthy lifestyle to a total health lifestyle. It is time to move from disease to health where we live, learn, work, pray, and play. It is time to eat healthy, be active, and resolve conflict. The evidence is irrefutable and the message is clear. We are charged with providing patients with the information they need to live a long, healthy life, which can readily be accomplished through lifestyle education. We, as caregivers, owe them that. Bodai BI, Tuso P. Breast Cancer Survivorship: A Comprehensive Review of Long-Term Medical Issues and Lifestyle Recommendations. Perm J 2015 Spring;19(2):48-79. DOI: https://doi.org/10.7812/TPP/14-241.